I have written before about my rather surprising love of watching the New York Knicks play at Madison Square Garden. What started as just another item I felt I had to tick off my list of things to do in New York has now evolved into a full blown passion. As my friends and family know, I can be very "all or nothing" and in this instance, I am very much "all' but even they are surprised as I am the most unlikely basketball fan one can imagine. After taking many different friends to games with me, who all enjoyed it thoroughly but not quite to the feverish extent I do, I'm so happy that the last friend I took with me, LE, has fallen as hard for the game and the atmosphere as I have and we've been to 2 games together already with many more to come I'm sure. Watching a live game is almost like a workout for me. It's so intense, fast, unpredictable and suspenseful that my heart races throughout and the constant adrenaline rush makes me dizzy and giddy at the same time. I jump, scream, swear, clap, cheer and usually lose my voice by the end of it. The beauty of the whole thing is that I only have a fairly rudimentary understanding of the game but that's enough - unlike other American sports like baseball or football, no advanced knowledge is required to enjoy it. There is something incredibly exhilarating and intoxicating about chanting along with 10,000 or so other Knicks supporters for a common outcome: victory. I have tried to capture a little of the atmosphere with this video taken on my iPhone but I must admit that it doesn't quite do it - not only does it not show how well you can see game but I also find it very difficult to stand still when cheering which makes recording quite challenging! 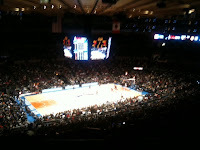 I must say that this year is definitely a more fulfilling one to be a Knicks fan because the team is playing very well. Last year, they only won 1 the 7 games I saw. This year, they've won all 5 games I've been to so far. Amare Stoudemire, their new star player and team captain, even broke a historical Knicks record last week by scoring over 30 points at each of the last 8 games the team played and seeing him do amazing dunks (all 6"10 of him seemingly effortlessly hanging from the basket) is an incredible sight. It is one of things I will miss the most if I ever leave New York for new adventures and the experience I most wholeheartedly recommend to anyone visiting the City between the otherwise dreary months of November and April.